When was the last time your board reviewed the company’s communication policy? When the company needs to communicate information, whether internally or externally, who handles it? Do you have a process in place to ensure that your message is clear and that it reaches its intended audience? What about shareholder, stakeholder or media inquiries, is there a designated person who responds to such inquiries and does everyone in the company know what to do if they are approached for a comment about your company or the services that you provide? Who will draft, implement and periodically review the policy for effectiveness? Who will be responsible for preparing the communication? Will it be done by an individual or by a pre-determined committee? Are there any particular circumstances when the responsibility may change? How will the information be disseminated, via a newswire service, an internal communication list/newsletter/blog or other method? Who will be designated to respond to inquiries? Will the communication policy include electronic communication such as email and social media or will that require a separate policy? 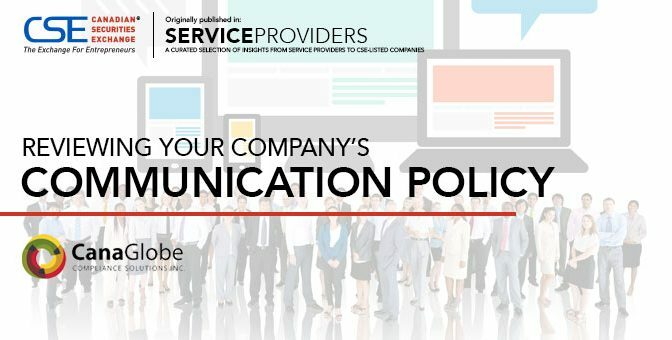 A communication policy is important for all companies. It helps to build a strong, consistent image both internally and externally and is critical in protecting your reputation. If your board hasn’t adopted or reviewed the communication policy lately you may want to suggest that it be added to the next agenda for discussion. This story was written by Canaglobe Compliance Solutions and featured in Service Providers magazine.